Our apartments offer guests a spacious living area on two separate floors. Downstairs, guests enjoy an open plan arrangement and benefit from a fully equipped kitchen with bar area, dishwasher, fan oven, halogen hob, fridge with freezer compartment, microwave, Dualit kettle and toaster, Nespresso coffee machine and comprehensive array of kitchen utensils. There is also a dining/working table, large two seater sofa and smart tv. The spacious ground floor bathroom boasts a large walk-in shower, heated towel rail, twin wash basins and loo. Upstairs the kingsize bed takes advantage of the views yet also enjoys a smart tv, full length mirror and dressing table. The aim with these apartments, is to offer a bespoke service combining the benefits of a hotel, serviced apartments and traditional B&B. We endeavour to offer an efficient service in luxurious home-from-home accommodation that enjoys both privacy and independence. The Hayloft enjoys stunning, unobstructed countryside views on both floors and a private screed garden. The Granary is a spacious two storey apartment (60m2) enjoying a private screed garden. Due to open Spring 2018. We aim to offer both immaculate comfort and a first-class service. Providing a luxurious and spacious home-from-home stay, our discrete kitchenette areas help bridge the gap between Hotels and self-catering, enabling you to take breakfast privately at your own convenience or heat up an easy supper if you so wish. Efficient WiFi, free wifi, outside-the-door parking and plenty of creature comforts help ensure a stress-free stay. The character features and traditional furnishings of this room are complemented by a contemporary shower room and discrete, yet comprehensive kitchen area. Our first and most spacious room "The Old Office" was stylishly converted into a self-contained boutique studio in 2012 and offers a peaceful ambience in which to work or relax. 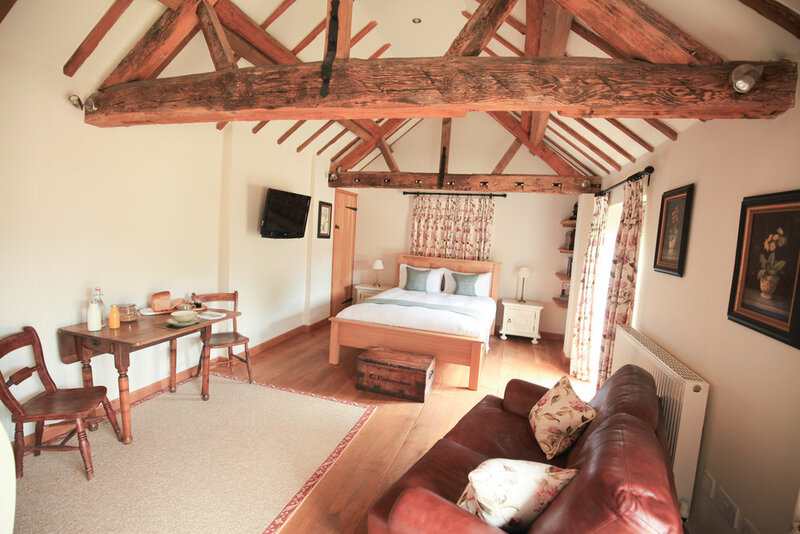 This cosy double room houses the same stunning character beams and furniture. Although slightly smaller than the other rooms, The Cottle offers the same comfortable home-from-home experience.